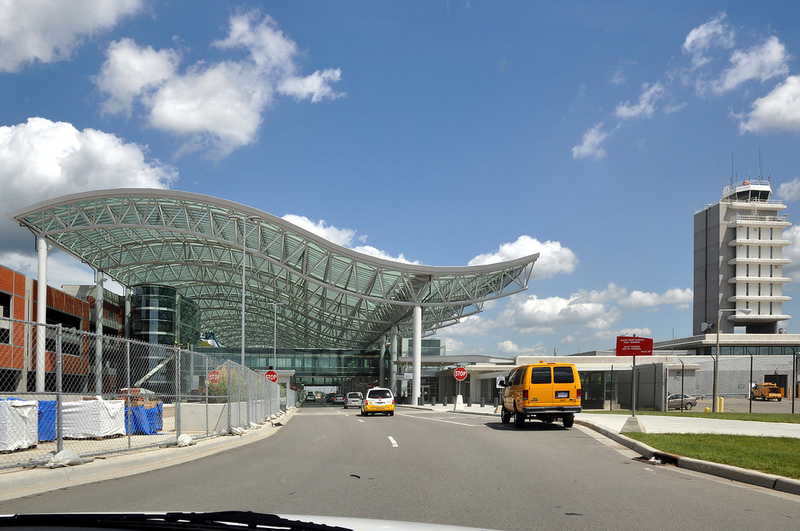 Why is the Kent County Airport so expensive? Kent County Airport /caribb on Flickr. Used under a creative commons license. The airline industry is in deep trouble. Possible pollution of the upper atmosphere is giving environmental groups a cause for demanding curtailment of services and taxes on putative excess carbon dioxide production. Services and on time flights have deteriorated. But the main difficulties are financial; last year’s spike in fuel costs effected the bottom line. The bankruptcy and shaky money situations of several airline companies in turn make lenders nervous, and drive up costs of borrowings. Lenders in turn have problems due to the poor economy. Nationally the number customers has fallen by around 20 percent in the past 2 years due in part to the lousy economy. Fares have had to be increased, arguably leading to a self-perpetuating downward spiral of airline use and profitability. Airports have not been unaffected by the general malaise in the industry. The diminished number of passengers cuts into revenues for the merchants in the terminals, so causing these businesses to bargain for lower rental fees. Parking fees are down. Failing airlines have stopped services to marginal destinations and let gate rentals that airports charge lapse. Gerald Ford International Airport (GFIA) has been caught up in this malaise. 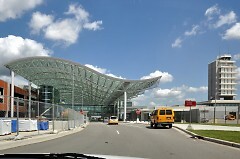 I use the airport frequently, and noted that prices for both flights and car rentals are much greater at GFIA than if I fly to and from Chicago, and drive up to Grand Rapids. My concerns led me to attend the September meeting of the Kent County Aeronautics Board, a voluntary board appointed by the Kent County commissioners that controls the airport. The meeting was attended by about 30 mostly insiders who knew each other. They sang “Happy Birthday” to one of their numbers. Susan Sherman in their publicity office took time to answer some of the questions that I had and provided some explanations for the high costs at the airport. The heart of the problem lies in there being little or no competition among the major carriers at GFIA. It seems that the major problem that plagues smaller airports is small size itself. The major trunk airlines adopted the hub and spoke system many years ago. They center spokes in major cities because airlines can justify flying into these cities as each yields large numbers of local customers, and justify funneling their other customers from smaller, outlying airports, through these larger airports to their ultimate destinations. The high volume at the hub airports lowers the costs that have to be tacked onto each ticket for several reasons. Fixed costs are defrayed over a larger number of passengers. The airlines can justify using larger aircraft, which are cheaper to operate on a per passenger basis. Repair, marketing, flight crews and training facilities all tend to be located at these hubs. The larger airport terminals are centers of commerce catering to the generally more affluent customers who fly so that they are able to collect better rents from the merchants who want access to this cliental. The airlines pay substantial rent for the gates that they use at these hubs, and monopolize these gates to keep competitors out. Smaller airports like GFIA share none of these advantages. These airports find themselves in ever-worsening positions. Historically, airports had the upper hands when they dealt with the airlines, and could turn down requests for landing rights. For a number of reasons, the relative power between the airlines and airports shifted 180 degrees about 10 years ago. One possible explanation is that legacy (old established airline) companies like Pan Am, TWA, and Eastern Airlines disappeared due to competition, and the survivors found that there were more airports than they could profitably service. Disturbances surrounding 9/11 made it even more difficult for airlines to operate profitably. Airlines could threaten to move out of markets, to cut flights on less lucrative routes and so dictate terms under which they served airports. So called Low Cost Carriers like Skybus in the midwest, Frontier and Southwest in the west, Ryanair in Europe, etc. partially took up the slack. They cut costs by flying directly between small, peripheral airports, no-frills services, and barebones marketing. Sometimes their fares were ridiculously low; Skybus had a 10 dollar fare, but they’ve since gone bankrupt. LCCs knew that they were doing these small airports a favor, and demanded to be paid for flying to these airports. Lansing’s airport subsidized the LCC JetAmerica with $1.4 million in grants in its first year, along with about $867,000 in waived airport fees and $1.1 million in marketing and advertising assistance. In the same deal, Newark and Minneapolis, each of which serve more than 20 million passengers a year, did not pay JetAmerica anything. GFIA has fairly full service from the major legacy airlines and customers like myself are able to get to major destinations non stop, but the prices can be made high because customers have a Hobson’s choice; as an example, I can fly that little Embrair 145 jet to Houston on Continental either at 6:30 in the morning or at 5:30 PM, packed in with every seat filled, or else spend a lot more time taking off and landing at intermediate airports. Interestingly, it almost makes economic sense to drive to Chicago or Detroit to make many trips, as experienced travelers have discovered, and so GFIA stagnates. For some reasons, LCCs, until Alliant Air recently, have avoided GFIA. Other fees at GRIA are also priced higher than at their competitors and that will be the subject of the next report. It's soooo true! Allegiant Air started flying from Grand Rapids in February, but they only serve vacation destinations. This is the kind of thing that makes me laugh when I read things like Grand Rapids is poised to be the next Chicago... I don't really see that happening when business travelers can't get a direct flight anywhere. This also really inhibits our ability to attract/keep young people from other states who come here for college. I have family in five states, and I can't afford to spend $350+ every time I want to go see them.